At least one day of my week is typically spent in my hometown. I love the sense of calm that accompanies a stay in the suburbs, and more importantly I find solace in the company of family. During these brief trips I like to take a break from my sharper city outfits and instead opt for ultimate comfort. The best thing about this particular look is that the sweater and jeans serve as the perfect base for layering, and thus subtle outfit-repeating. The oversized blanket scarf makes such a bold statement that you can easily get away with wearing the underlying top on repeat. To add some sparkle to the darker look, I added on this lovely Baubles & Gems hand chain. I am not typically one to wear hand chains, but I've recently been loving the unique touch they add to any outfit. Let me know how you stay cozy with style this fall -- and fingers crossed that winter doesn't arrive too soon! PS. 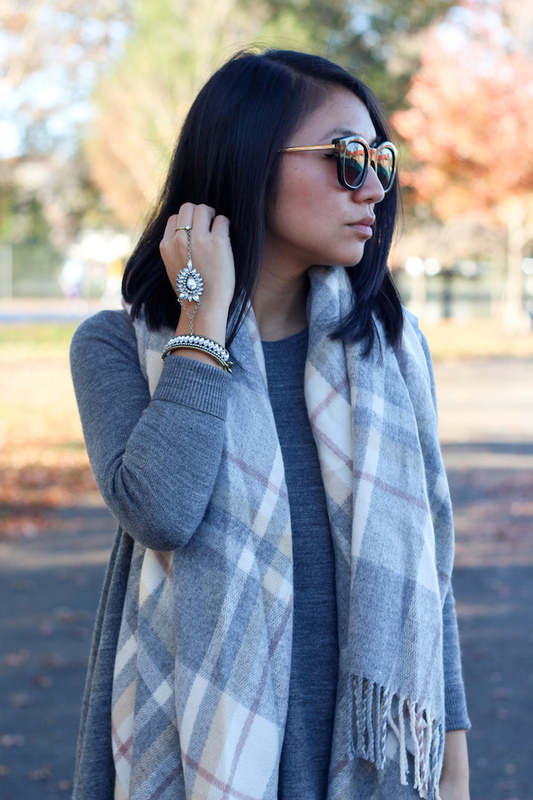 Use the code XOLOOKSBYLAU for 15% off your purchase at Baubles & Gems! Thanks, Janeese! It's one of my favorite pieces! That hand chain looks great. Love the stone in the middle. Thanks love! Always so sweet! You look awesome dear!! Love the outfit,the hand chain is so pretty!! I feel the same way about fall passing by so quickly. I can't get the fact that winter is coming in just a little over a month in my head. Why can't the weather stay like this forever? Anyways, I'm loving your outfit and I'm obsessing over that scarf! Ahh, I know! I'm so not ready for winter weather. Thanks for the sweet comment! I totally agree - that sweater is a great base for layering. 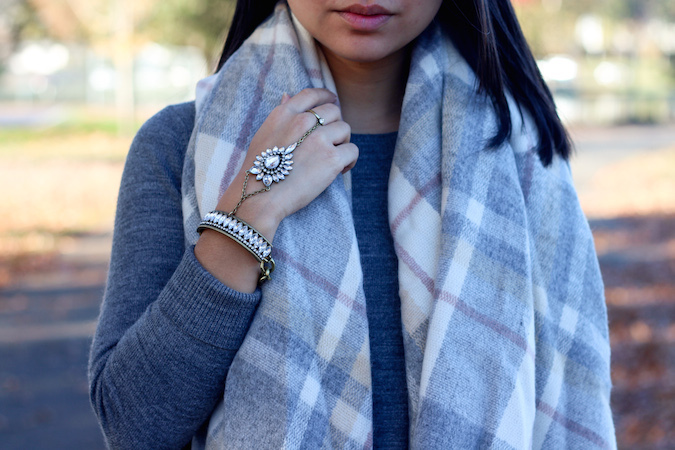 Love the scarf you paired with it! Couldn't NOT see this amazing hand piece! Love it too much!! Thanks! I am loving it as well! What a gorgeous autumn outfit! Absolutely love the scarf! Gorgeous scarf. The whole outfit is so much up my street - loving it!! indeed...time goes by so fast! It's amazing how time flies by. I love this simple chic look! Your scarf is so cute! Great look, the chunky scarf is so fab. I love the color and the bangles are so pretty.